Colorado Soccer Association and the Colorado Referee Administration annually recognize the top young male and female referees in Colorado Soccer with the Young Referee of the Year award. Recipients of this award are honored for their accomplishments as a referee, student and member of the community. 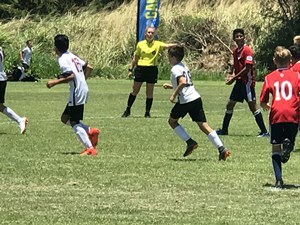 Those applying should be working the highest level tournaments (State Cup and President's Cup) in the state during the nomination process and be prepared/available to attend Far West Regionals and/or Far West Regional Presidents' Cup in June if selected as the Colorado Young Referee of The Year. The award is presented each January at the Colorado Soccer Association Annual General Meeting Awards Banquet. © Colorado Referee Administration. All Rights Reserved.